OAPS is a school founded on the philosophy that play is a child's vehicle for learning. We view learning as a natural and ongoing process, occurring as we interact with our environment, and we view each child as an individual who develops and discovers in their own ways. Building meaningful relationships between teacher and child, and among other children, is central to the work we do. Sensory Table/Play Dough: (sand, rice, water, etc. )—pouring, hand-eye coordination (writing skills); counting, measuring, balance (math); sharing (social skills); imagination, role playing (creative thinking & social skills). Puzzles & Manipulative Toys: observation, motor planning, hand-eye coordination (reading &writing skills); shape recognition, spatial awareness, matching, classification (math, science, & critical thinking skills). Imaginary Play Area: fact, fiction, role playing, imagination (creative thinking, social and emotional skills); awareness of community – workers, helpers, diversity (social studies). Indoor/Outdoor Play: cooperative groups, taking turns (social skills); gross and fine motor development. 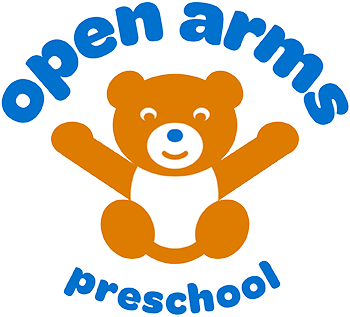 Here at Open Arms we believe in fostering friendship and learning through play. We strive to provide an enriching environment where children can develop a sense of self, engage in activities that will increase their love of learning and grow their independence, while fostering social skills. 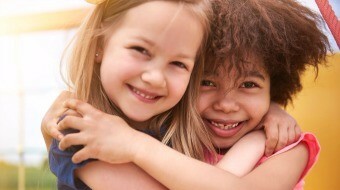 Our loving and caring staff helps to ensure that each child feels safe and secure. We want your child’s first school experience to be the best foundation for many learning years to come.